Do Light or Noise Work? We operate the Chicago, IL branch of Animals in the Attic. Call us any time to discuss your wild animal problem, and to schedule an appointment. Welcome to Animals in the Attic of Chicago! We are a professional wildlife removal company servicing Chicago Illinois. We specialize in the removal of critters from the attic of homes and businesses, and are respected in Chicago as the best wildlife specialists for this unique work. Whether you have a family of squirrels, an infestation of rats or mice, a destructive raccoon with babies, or even a colony of bats or birds, we take great care to remove the wildlife from your home safely and effectively, and we solve the problem permanently, with guarantee! We provide all the services needed - from complete 30-point home and attic inspection, to the trapping or exclusion of all the animals, including any nests of babies, to complete animal-proofing and repairs, we do it all. We also provide attic cleanup services, if needed. We are fully Illinois licensed and insured. We operate 24 hours per day, 7 days per week. Call us any time, and we will be happy to discuss your critter problem, and provide a price estimate for the work needed, and schedule a same-day or next-day appointment. Call us any time at 773-770-4413. We look forward to hearing from you. We service all of Cook County, including the towns of Arlington Heights, Palatine, Wheeling, Northbrook, Glenview, Wilmette, Skikie, Evanston, Park Ridge, Des Plaines, Oak Park, Berwyn, Cicero, Burbank, Oak Lawn, Orland Park, Oak Forest, Harvey, & Calumet City. Do all raccoons have rabies? For many of us, we see raccoons in movies and cartoons and think that they are loveable troublemakers that are so cute and cuddly. While they may look cute, there are a lot of issues that come along with raccoons. Not only are they wild animals that can be quite dangerous when cornered, but they also carry a lot of parasites and diseases. This makes them even more dangerous, especially to your health. One of the common illnesses that raccoons carry is rabies. While we generally associate this with dogs, rabies is quite common in raccoons. This is one of those misunderstood things that most people have about raccoons. They don't think that this animal could be carrying such a dangerous disease, and so they find themselves reaching out to raccoons when they see them or provide food to get them to come back. They think the raccoon is cute and equate cute with safe. That is just not the case. While many raccoons do carry this virus, people need to know the truth. That is that some raccoons have the rabies virus, but not all of them. In fact, less than 13 percent carry the illness according to several scientific studies. This means that about seven out of every eight raccoons does not carry the virus, making them less dangerous than some would think. Do not let that fool you however. While a majority does not carry the rabies virus, all of them carry parasites that are dangerous to you, even for you to breathe. You simply cannot be around these animals or their waste without endangering yourself. Simply inhaling these parasites can cause severe respiratory or neurological problems and this is why keeping them away from your property and home is a major priority for you. It is important to point out that you should always be safe in dealing with these animals. Most do not carry the rabies virus, but should be bit or scratched by a raccoon; you should absolutely go to the doctor right away. If you contract the virus and wait more than a day you will die. This can be treated if caught right away, but if you wait there is nothing that can be done. You have to take precautions right off. If possible, see if the animal can be caught or killed. Having it examined by a doctor will let you know if it carried the rabies virus, and if you can avoid the series of shots needed to treat the illness, you should definitely do so. Call Animals in the Attic Chicago, IL Today! If you have animals in your house, it's important that you hire a company that will do the job correctly. 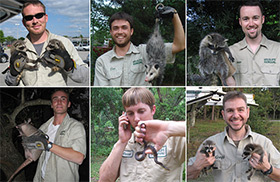 We do a complete job from start to finish, for a permanent solution to your Chicago pest control wildlife problem. We inspect the house, remove all of the animals humanely, repair the damage, and seal the entry holes with guarantee, so that you never have crittes in your attic again. Call us any time at 773-770-4413 for complete wildlife removal in Chicago. We look forward to hearing from you! We operate the Chicago, IL branch of Animals in the Attic. We are available 24 hours a day, 7 days a week to address your wildlife problem. We are fully Illinois licensed and insured, and pride ourselves on our excellent service and record of success in humanely removing wildlife from the attics of Chicago homes. © Copyright 2019 by animalatticpest.com. Call us in Chicago, IL any time at 773-770-4413.